If you want to have a powerful and meaningful prayer life, if you want to impact the nations for Christ through prayer - Operation World is for you. Join millions of praying people around the world using this book to inform, inspire and ignite their prayers. When you hear a country mentioned in the news or in a conversation and you want to know more about it and what God is doing there - this book will help you. Engage your heart and mind in global prayer with this thoroughly-researched, fully-updated seventh edition. It is loaded with clear, concise, accurate information on peoples, languages, religions, denominations, spiritual trends and prayer needs - for every country in the world, from the largest to the smallest. Leading evangelical mission leaders, scholars, writers, pastors and lay people all over the world rely on this book, refer to it, and quote from it regularly. Every fact, number and statement is checked and re-checked with global and local experts in each field. 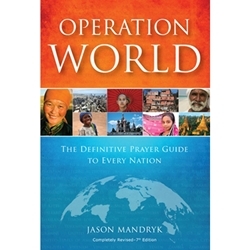 Jason Mandryk and the Operation World research team asked Christian leaders everywhere: "How should the body of Christ throughout the world be praying for your country?" This book is the result.